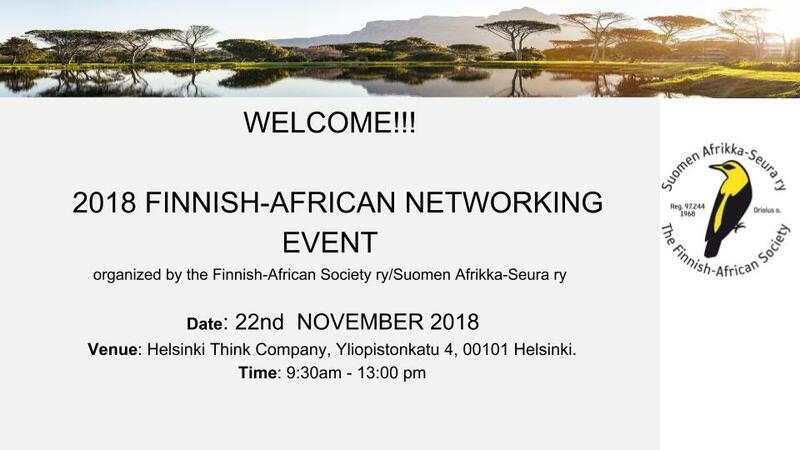 The Finnish-African Society ry is pleased to welcome you to its annual business and networking event in Helsinki, Finland. Venue: Helsinki Think Company, Yliopistonkatu 4, 00101 Helsinki. This year’s event will showcase special guests Pasi Nokelainen and Esa Salminen authors of the new book “Afrikan valloittajat”. They will share their experiences on their journey when writing the book. The main aim of this networking event is to encourage more Finnish companies, investors, entrepreneurs and stakeholders to conduct more business investments in Africa. There will be a networking session at the end.